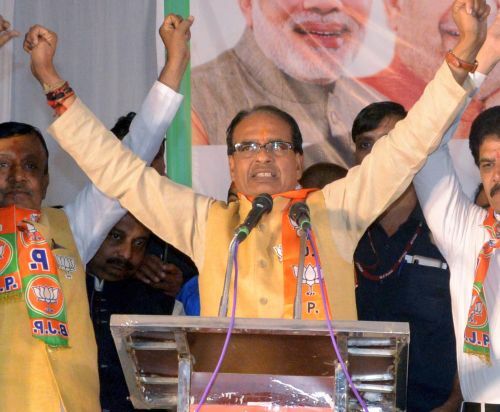 Madhya Pradesh will vote in a single phase election on November 28 to elect a new legislative assembly. The tenure of the current assembly is slated to end on January 7, 2019. Counting of votes will happen on December 11 along with Chhattisgarh, Mizoram, Rajasthan and Telangana. After 15 years in power, the Bharatiya Janata Party is facing significant anti-incumbency. The poll battle is expected to be a one-on-one contest between BJP and the Congress, albeit a possible bump courtesy Mayawati-led Bahujan Samaj Party. Rediff Labs analysed the 2013 assembly election results to develop a Sentiment Meter for the 2018 electoral battle in Madhya Pradesh.